Cunningham is popular in Ireland but actually of ancient Scottish decent. It comes from an area in Ayrshire dating from the 1150AD. Leave a message for CUNNINGHAM family members. (Part 1 of 3) The Cunningham name is from Scotland, but its origin according to DNA is from the north-west coast of the Emerald Island. 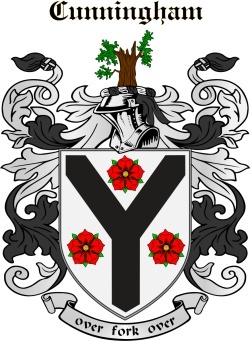 The Cunningham story [dominated by DNA tribal marker R1b-L513, Subgroup A1] can trace their origins to the Finn Valley in Donegal, Ireland from 50 BCE. Perhaps the journey begins with the Clanna Dedad; Deda, son of Sen or Deda Mac Sin. The Cunningham surname origin is from a Northern Ui Neill [R1b-L513] tribe. The Cenél Eoghan and the tribes of Donegal conquered much of Ulster (Derry and Tyrone). (Part 2 of 3) Cenél Eoghan will expand across northern Ireland with their cousins Cenél Conaill and the Northern Ui Neill between 500-800 BCE. The clans of Finn Valley have the same DNA as people from Gwened in Brittany. But how could this be? Recent discoveries from DNA testing are unlocking the migration patterns of Celtic tribes as late as 800 CE to 1200 CE. The Cunningham story begins in pre-history Ireland then moves to Scotland as they form part of the Dalriada. Descendants of their tribe will then travel to Brittany, France during the Dark Ages. (Part 1 of 3) The Cunningham name has a long history in Scotland, but now DNA and some recorded history says its origin is from the north-west region of the Emerald Island. The Cunningham story [dominated by DNA tribal marker R1b-L513, Subgroup D2] can trace their beginnings to the Finn Valley in Donegal, Ireland from 50 BCE. Perhaps the journey begins with the Clanna Dedad; Deda, son of Sen or Deda Mac Sin. The Cunningham surname origin is from the Cenél Conaill [R1b-L513, Subgroup D] who found the Dál Fiatach. (Part 2 of 3) A group will also found the Kingdom of Ercing in Wales as trade with Romans will become essential around 300 CE. But how could this be? Recent discoveries from DNA testing are unlocking the migration patterns of Celtic tribes as late as 800 CE to 1200 CE. The Cunningham story begins in pre-history Ireland but this line and many of his kin will move to Wales, then travel to Brittany, France during the Dark Ages. Invite more CUNNINGHAM family members! Click 'Invite' to connect with more members of the CUNNINGHAM tribe.